I know some folks have been awaiting the results for the Light Harmonic Geek Out V2. As you know, I have already provided a bit of a preview a few weeks back so no need to say much more I think. Generally my feelings about this device have not changes over the weeks... The 3D printed plastic smell has completely dissipated by now. It does sound great and I must say, going into the measurements, the impression was that this is some of the best sound I have heard from these little USB devices! Remember, this is a $235US unit I got as an "early bird" off the Indegogo promotion. Let's see if the measurements are consistent with some of my early subjective impressions. I was looking over the measurements over the last few months and realized I neglected to post results of the PonoPlayer doing DSD64 and DSD128 playback! So, instead of the data just sitting on my hard drive, I thought I might as well throw it out here for reference. I don't believe I have seen anyone measure results of DSD playback with the PonoPlayer. I suspect a reason for this is that DSD was an "add-on" firmware upgrade released after the major magazines got a hold of these units for review. 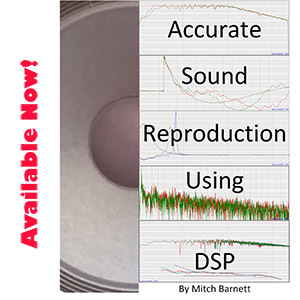 But then again, how often do you see measurements of DSD output quality?! I'm guessing that DSD playback was a "checklist" feature that some people wanted or it looked good for the company to support. Of course DSD is an acceptable input data format for the ESS SABRE9018K2M DAC chip (as it is with essentially all high quality DACs these days). 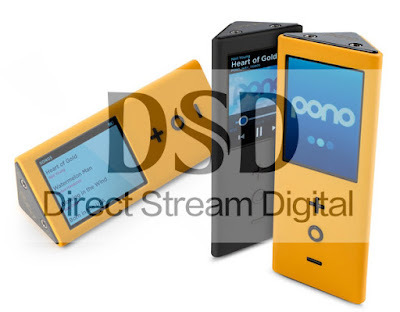 DSD has been enabled as of firmware 1.0.5 back in February. For my tests, I'm using 1.0.6 from the May 2015 update. Ahhhh... The ASUS Essence One! Even though looking back, compared to others I have listened to or measured, this DAC had its various imperfections, it has been my constant companion on the computer workstation. Through it, I have listened to hundreds of hours of music, edited my share of audio, evaluated pairs of headphones, and run various "experiments". Like an old friend, you get to learn (and at times even appreciate) the quirks. 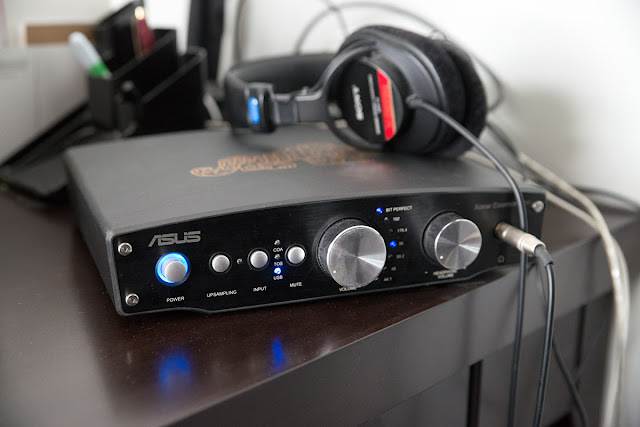 To this day, it remains my "workhorse" DAC. Why, you might ask? Because it has 2 nice big volume knobs. One for speaker output, the other for the headphones... Simple as that :-). Many years ago, back in 1992 to be precise - the year Windows 3.1 was introduced, when the typical PC was running below 33MHz, and Mortal Kombat 1 was hot in the arcades - I vaguely remember reading this article from Stereophile and filed it in my memory banks as something from science fiction for another day (I heard my first MP3 compressed song soon after and thought it was amazing given the data compression!). In it, Peter W. Mitchell reportedly "heard the future" and was clearly impressed by the technical wizardry of what a "Digital Signal Processor" could accomplish. The power of the digital room correction was described as "mind-boggling". If you haven't thought much about digital room correction, I would highly recommend reading that article in its entirety and consider whether the arguments make sense to you. I don't recall reading anything further about AudioSoft or whether Snell eventually created this cartridge-based "black box" audio correction system, but as we fast forward to 2015, we are living the legacy of what was described. These days, DSP techniques are commonplace. As digital has long supplanted analogue as the preferred method of encoding our audio and video media with high fidelity, it has all become data that we can examine and modify as we desire depending on the situation. Compress to MP3 for times we don't need highest fidelity? No problem... Resize from 1080P to 720P for the cell phone screen/storage? By all means! Explicit uses for improving audio quality include audiophile offerings like DEQX and Lyngdorf (including McIntosh MEN-220), some products like the Devialet amps include their "Speaker Active Matching" correction filters, and the home theater crowd have been using Audyssey and the like for years. It is interesting these days then that DSP room correction is primarily the domain of home theater and AV receivers, rather than high-end audio. In fact, reading certain "high end" audio forums suggest a stigma against DSP techniques to improve the sound of an audio system. Among audiophiles, it's not unusual to see suggestions around listening to tubes, turntables, and vinyl LPs as providing some kind of elevated audiophile experience, but I've ironically experienced the cynicism when you bring up the idea that digital room correction is important if not essential as a very desirable way of improving the high-fidelity experience. 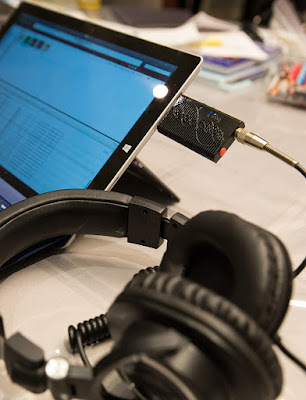 As you probably know, for me, convenience and practicality are the most important elements of mobile audio. As much as I enjoy the audiophile hobby and achieving high fidelity sound, I think it's important and realistic in acknowledging that consumption of music on-the-go these days is tied in to the ubiquitous "smartphone" many of us carry around. They have become indispensable tools in so many ways that for music lovers and audiophiles to not take them seriously IMO would be denial. I think it's fascinating that audiophile magazines rarely ever mention these devices despite the fact that millions of us use them every day and gain so much enjoyment in the process! 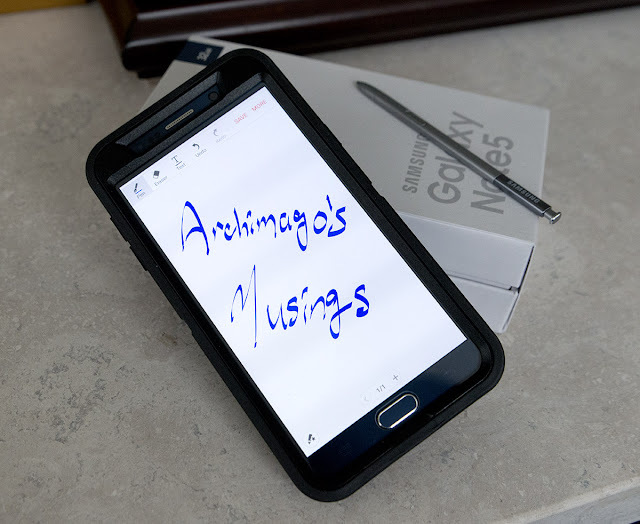 The last phone I got was the Nexus 5 which I measured back in early 2014. As you can see, it doesn't measure too well using the standard test bench but adequate for busy environments. Not inspiring 16/44 performance and it does accept 24-bit audio but can't really perform beyond close to 16-bit dynamic range. It's also limited to standard resolution 44kHz only. Last year, my wife got the iPhone 6 which I also examined. Up to 24/48, it performed well subjectively and with objective measures. Clearly a step above my Nexus 5 in terms of achieving >16-bit dynamic range. In terms of output impedance, Ken Rockwell measured the iPhone 6+ as 3.18-ohms and the Nexus 5 is probably around an unimpressive 10-15-ohms. Shown in Otter Box case.